In his statement this morning about the London Riots – David Cameron announced more powers for police to take down social networks in times of civil disturbances. Leaving aside how that would even be possible, this really is a step too far. Blackberry Messenger may have been used to facilitate the riots – but it didn’t cause them – any more than the road system or public transport did – though they also may have helped move people around. Angry people broke those windows, not messaging software. As for services like Twitter and Facebook – they were invaluable sources of support and information for people affected by the riots. It was localised, it provided information that neither the TV news nor the police could, and provided contact and advice from friends that I couldn’t have got otherwise. The BBC couldn’t tell me that my friend Holly was alright could it? Cameron’s threat to ban social media is also deeply ironic because the British were among the first to criticise former Egyptian dictator Mubarak for taking down the internet during the democracy protests there. The move rebounded on Mubarak because it made people who weren’t previously politicised annoyed that one of their basic commodities had been arbitrarily taken away from them. And for godssake – telephones and texts will still work – and if you ban BBM and Twitter, will you ban WhatsApp and Google + too? Where do you stop? There are dozens of instant chat apps and you can’t block them all. I mean he couldn’t ban newspapers could he? What with freedom of speech and all? These modes of communication are our generation’s newspapers. They need to be protected in law. I’m going to riot if someone takes Twitter down. That’s community vandalism. “Mr Speaker, everyone watching these horrific actions will be stuck by how they were organised via social media. Hey, Mr Jonny Hammer shill. You obviously already know, but I’m posting for the benefit of others. This is the one part of the riots that wasn’t making sense to me – all the reports of the Blackberry sharing and stuff. DANG! I’M SO STUPID. I was looking towards this flse-flag as an excuse to impose martial law, or at least have excuse to try to justify more powers to armed forces, leading up to the engineered financial collapse. Well, now I see what it was all about. “They”‘ve been tweaking and messing and blocking all of the viral truth movement on Facebook and YouTube etc [Not surprising, as Facebook and Google work for them]. They really don’t like us telling and sharing the truth about their evil globalist deeds. Now I know that this was mainly engineered as an excuse to close us down. Tell Cameron to go back to his bosses and warm them we already know. Or go back to your bosses, at the very least. Those are the most terrifying words I have heard all year. I hope someone who will not be named is listening. On the other hand, if they looters really are acting against the greater good, and it looks like they are, I think that same anonymous power could use it’s might to track down and punish the looters. 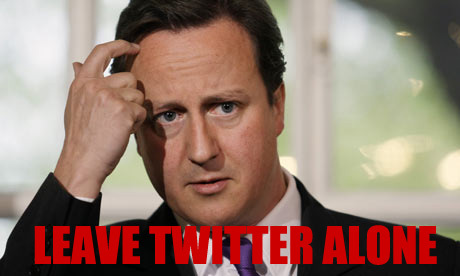 cameron is talking really stupid now, if anything he will insight problems the way he is going on. hes the one that has closed youth clubs, commnity centers,charitys need i go on. now lets cut the police, customes etc and lets not inject moneneys into factorys and companeys to help grow the uk. hes the one that has a riot in 15 months, the last conservertives it were at least a few years. hes an idiot and does not hear anyone. this goverment need booting out, and out now. cameron is talking really stupid now, if anything he will insught problems the way he is going on. hes the on that has closed youth clubs, commnity centers,charitys need i go on. now lets cut the police, customes etc and lets not inject moneneys into factorys and companeys to help grow the uk. hes the that has a riot in 15 months, the last conservertives it was at least a few years. hes an idiot and does not hear anyone. this goverment need booting out, and out now.